We had a busy yesterday. After being cooped up for three weeks, Tom and I decided it was time to get the boys some fresh air. I had to be in Greensboro, NC yesterday afternoon, so we left early in the morning and went to the NC Zoo in Asheboro first. The boys were finally feeling well collectively, and we had a nice, low-key day outside. On the way home, it occurred to me that the holidays are now rampaging toward us full bore, and if we didn't put the Christmas tree up soon, it wasn't going to get put up at all. Much to Tom's horror, I suggested we do it when we got home (after a six hour drive in the car). Poor guy. He had real reservations. 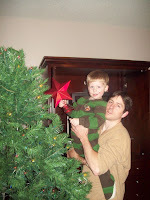 Christmas trees laden with expensive ornaments sound like a recipe for disaster with Maurauding Pirate #1 and Maurauding Pirate #2, but I argued that Sam has been doing much better of late and if he helped us put the tree up, he'd be less likely to try to tear it down. 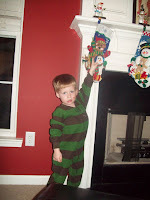 So after dinner, we put John to bed and unloaded the hall closet of its Christmas boxes. Sam had fun helping Tom "fluff" our artificial tree. 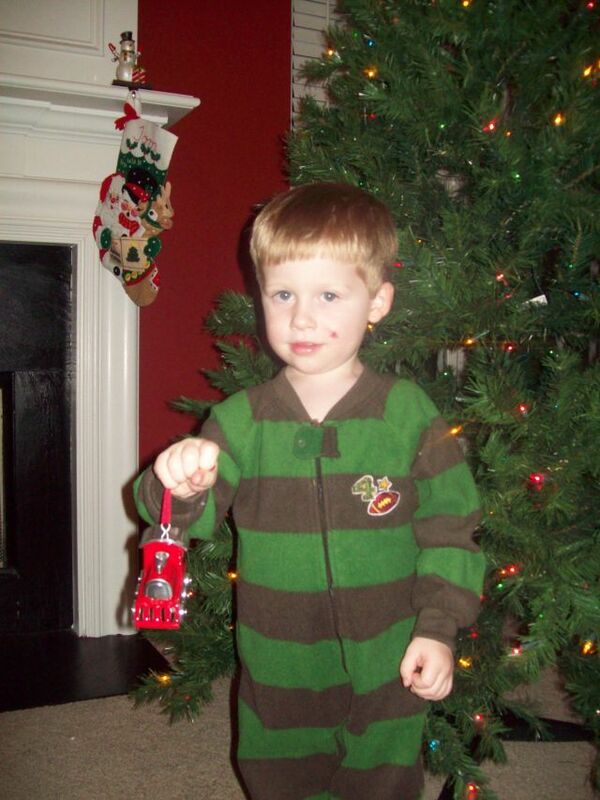 When I was little, my mom always took me to Hallmark to pick out a couple of ornaments each year. When she moved away from home for the first time, she'd gotten very depressed at Christmas without any ornaments of her own, so she always wanted me to be sure to have my own. 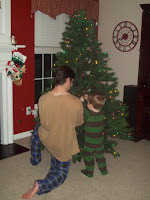 I'm continuing that tradition with the boys (except they have to pick one--we are in a recession, after all). 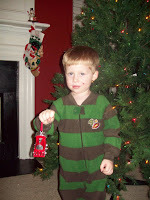 And this is the ornament Sam picked for himself this year--big surprise--it's a train. 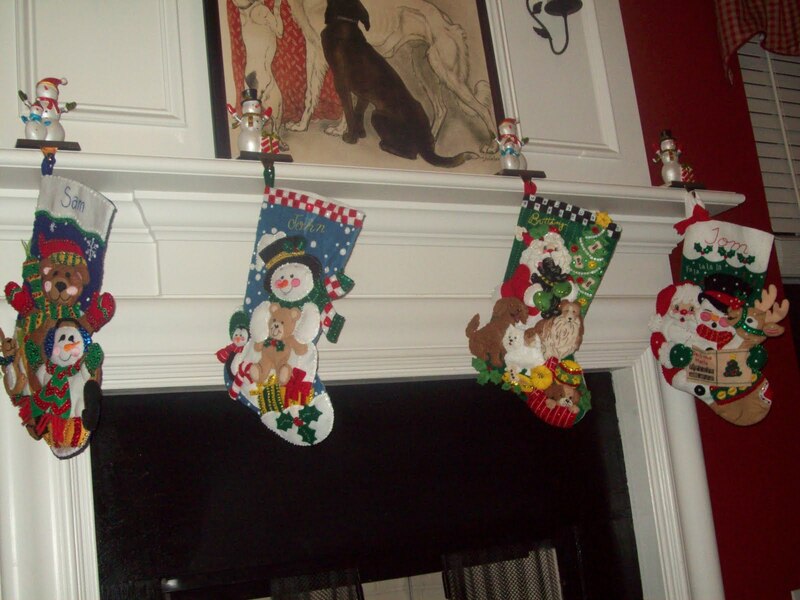 Here are the four stockings I've made over the years for each member of the family. 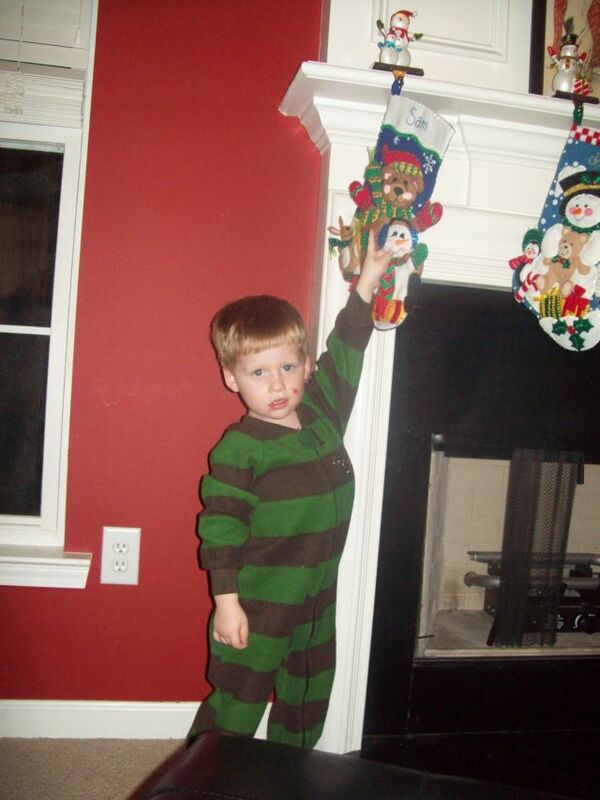 Sam can identify his name on sight now, and was very excited to point out his stocking to me. When everything was finished, I had Sam pose for us and say "Ta-dah!" Those are great stockings! We keep seeing more lights up already and I keep trying to delay the decor. Maybe I should give up and just let Melody get started. We are having a rainbow tree this year she decided and my husband has yet to discover this! hooray! 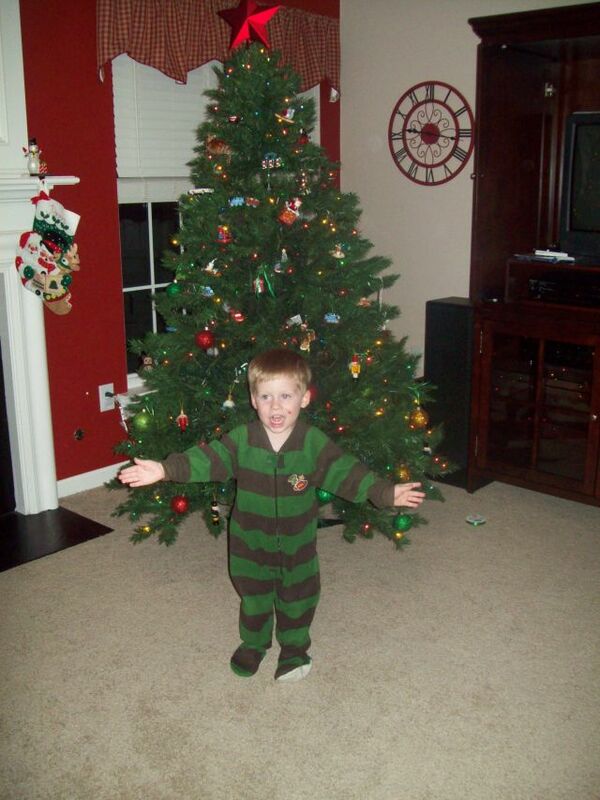 someone else who lovess to start Chrsitmas early! Now you've given me the "but i know someone who already has their up" excuse when I try and convince hubby this weekend!